We're now in Dali, Yunnan Province. Its 17°C! Just walking the streets and found these great butchers where the meat is hung outside next to the clean channels of water that run down the streets. They seem to use everything, oh except for the bile that we saw the butcher piercing out from piece of animal which I couldn’t identify. 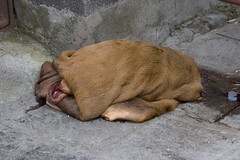 Bianca thought the skin sitting outside the butchers was a sleeping dog for a while. Hi Bianca and Phil - thanks for the flickr message - great pictures! Hope you like Lijiang. It's a bit of a tourist trap bu the old town i still nice. I hear there is also a chairlift up the mountain these days too. If you have time a trip to Lugu Lake is worthwhile - it's a 3 day return trip and you can organise it via the youth hostel in town. Anyway, I'm sure you'll hear all about it from the locals. Nice one ! Another blog for me to watch - and sigh over. Ah. You're going to Eygpyt! I so should have put that on our itinerary last year. Enjoy the wandering ! B.